This cover concept mock-up was done by Angel Criado and Steve Criado. This is one of several mock-ups and the final artwork may differ. 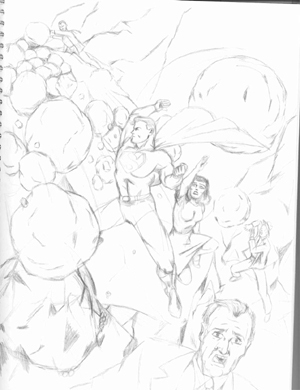 Comicbook artist Angel Criado is in the midst of reconstructing the missing pages of Jerry Siegel and Joe Shuster's "K-Metal from Krypton" story, with the aim of presenting a complete online comicbook of the work. This involves writing an exhaustive outline and script based on and incorporating all of the story fragments and synopses that are available. We are very excited to be able to present a sampling of some of his work in progress. "I didn't think it was going to be easy and I'm going to have to apply 'artistic license.' There are so many pages, pictures between the end of one page to the beginning of the next page we have. 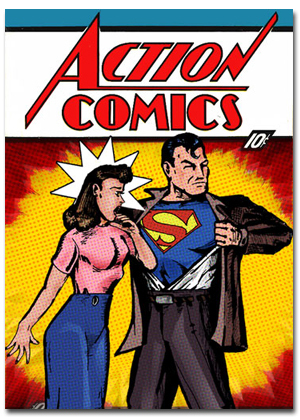 So I'm reconstructing the missing parts based on no small part of my understanding of the Golden Age Superman. "A key factor in this project for me is to make it as close to Shuster as possible. I want to be as convincing as possible, and make this appear seamless. You wouldn't believe some of the research I am working on. I have to be able to duplicate a Shuster Superman, Lois, et al. I have to understand his layouts, etc. I literally have to walk a mile in their shoes." "Here is a very rough draft of the art for the first page. I took a lesson from George Pérez who only draws in blue pencil before the final lines. This should give you an impression of what I am planning. "At first I had no idea how I was going to present this picture. It went through several versions, until I read the Siegel and Shuster interviews and got inspired by what they were trying to do. Then it came really easy."